Jamie On The Run: Why?! When I drone on about my running to anyone who will listen, the questions people ask me the most are why do I do it and how did I get started. I’m not quite sure if I can answer the first question but I will try my best with the second one. I have after all taken up running relatively late and have only been training and racing seriously for around a year. I first dabbled in running back in 2002 when I joined a group of school friends in signing up for the Strathclyde Park 10K. My mum bought me a pair of running shoes but I didn't go as far as actually doing any training! I didn’t even go a for a run as far as I can remember and planned on relying on my fitness gained through playing football, badminton, squash, golf and all those actual fun sports! In the race I managed to post a time of around 38 minutes, which I didn’t realise at the time was pretty good. But then Charlie Steven, a teacher at Strathaven Academy approached me. Charlie encouraged me to take up running and join the Calderglen Harriers running club, based in East Kilbride. I duly obliged and went along to a few training sessions in East Kilbride. I even got to go out of school to compete in a Cross Country race in Ayr – I have to say these are very hazy memories as it was so long ago. To my regret, after a short period of time I decided running wasn’t for me. I think I just found it boring and wasn’t really getting anything out of it. Looking back on this attitude now it seems crazy. A year later I did the Strathclyde Park 10K again posting a similar time. After that I wasn’t to run again for another 4 years when I took part in the Dumyat Hill Race at Stirling uni which proved my fitness was lacking. I didn't do anything about it though. Then after moving down to London I saw an advertisement for the London Bupa 10K. I thought it might be quite cool to run past some of London’s famous sights and would be a good way to get some fitness back so I entered. This was to be a turning point. I did a few weeks training but was disappointed with a time of 41 minutes. I did enjoy the event though and I suddenly got a hunger for more, which has remained ever since. My time spurred me on to enter some more 10Ks and I decided to put in some proper training. My first real target was to beat my Strathclyde Park 10K time. 5 months later I had achieved this, recording a time of 37:33 in North London. It was an emotional moment as I had been so determined to get back to my best. My target for the next year was to get under 35 minutes and I managed this with 6 months to spare, recording a time of 34:59 twice this August. While I was doing all my 10K training and racing, my good friend from uni, Lynsey, was quietly knocking out half and full marathons left right and centre. 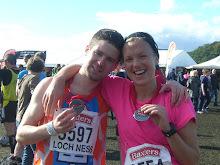 She persuaded me to sign up for the Edinburgh Marathon and I haven't looked back ever since! 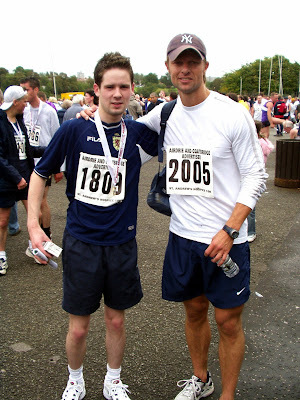 This was when I really started training properly, running at least 6 times a week and covering from 50-70 miles a week. This isn't easy and I've been fortunate to receive and lot of support from friends and family. My next target is the most ambitious of the lot….